Korea is so famous it sometimes confuses people. As is well known by everyone everywhere, everything in Korea is famous. Some non-Koreans, upon first arriving can be overwhelmed by it all, even going so far as to act as if unaware of just how famous everything around them is. Koreans occasionally misunderstand this bizarre foreign behaviour as stemming from sub-standard non-Korean education systems, or even willful ignorance borne of intense jealousy. Koreans should be aware however that the majority of foreigners subconsciously employ this strategy as a short/medium-term survival mechanism, lest their heads explode from K-fame-exposure overload. All this helps explain why Koreans often seem very pleasantly surprised when explaining to a foreigner that something is very famous, only to find out that the foreigner has already heard of the very famous Korean something-or-other, or maybe even knows what or who it is! Koreans appreciate this greatly and, in my experience, never adequately explain why it is so amazing that the very famous thing is not such a huge secret. To experience something famous first-hand, the world-famous cuisine is a good place to start. Korean food is awesome, and all Korean food is famous because it is. It’s also easy to find. Due to the nation’s insane population density and insightful city planning, a famous restaurant shall be no more than 300 feet from where you are standing. For some reason your Korean friends will insist on driving 40 kilometers, past 17,000 restaurants, to the one that is even more famous. Upon arrival at the famous street with 23 restaurants selling the same famous dish, one must stand in the queue outside the only one with a queue. This is the most famous one, so it is the best. There will be a wait, but don’t worry – this one’s also more expensive. One of my favourite famous comfort foods is 부대찌개 (army stew). It originated in Uijongbu, just north of Seoul, so it is imperative that one makes the trip to Uijongbu to eat it. I worked in Uijongbu for 5 years so I enjoyed 부대찌개 there. Almost criminally, I ate it near my workplace rather than making the pilgrimage to the famous 의정부 부대찌개거리 (Uijongbu Budae Jiggae Street), which is pretty much as its name suggests. Some of these extra-famous restaurants have interesting historical back stories, and there is a sense of occasion when eating at them after learning these tales (though I wonder how the other 19 empty neighbouring identical restaurants survive). 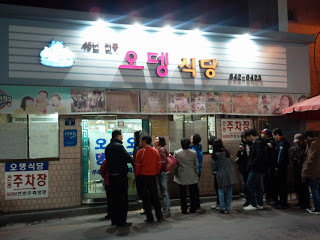 The world’s first Budae jiggae restaurant, Budae Jiggae Street, Uijongbu. This is ‘Odeng Shikdang’, the world’s first budae jiggae restaurant, where Heo Gi-suk, the owner and inventor of the dish still works today. She invented the dish (army base stew) as a cook on an American army base shortly after the Korean War. Food was scarce, and Heo and the other cooks smuggled leftovers from the base. 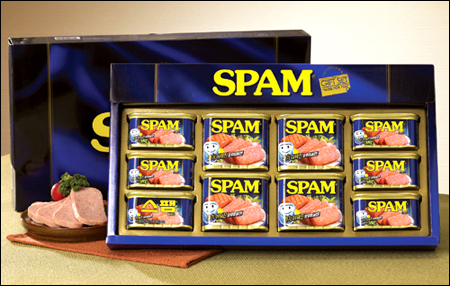 They got hold of whatever was available – generally spam, hot dogs, baked beans, instant noodles and processed cheese. Heo threw these delicacies in a pot, boiled them into a stew with some kimchi and red bean paste (to make it locally palatable), and voila! It sounds terrible, but is the perfect example of the whole being greater than the sum of its parts. Here, the late great Anthony Bourdain cooks his version of 부대찌개 for his friend Anderson Cooper. Anyway, every town and suburb in Korea seems to have some such story. It’s great! These stories help bewildered foreigners like me to understand seemingly bizarre national customs, like why Koreans still spend a small fortune each year at Chuseok giving each other presentation gift sets of spam. Next articleKoreans Comprise the World’s Largest Diaspora, say Koreans. 6 Comments on "Korea: Where Everything is Famous"
Heo was a hero to the people. This article made my day, thank you. Hahaha this made me laugh. Continuously. Thank you.